Thursday is supposed to be a beautiful day. Sunny and 60 debgrees. I wish I wasn't working today. 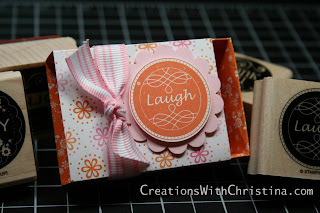 I just love the Matchbox die that is in the mini catalog. It is so much fun to work with. You can use solid cardstock, designer paper, clear sheets and the matching stamp set is great too. This one is made using Tangerine Tango Designer paper, pretty in pink ribbon and cardstock, and I also used the Lovely Labels stamp set. I really need to spend some time cleaning my office. It is a mess. I've got punches, paper, ink pads everywhere. I'm also working on updating my SU! catalog to reflect the stamp sets I own. That's a job. Hope you all have a great day.